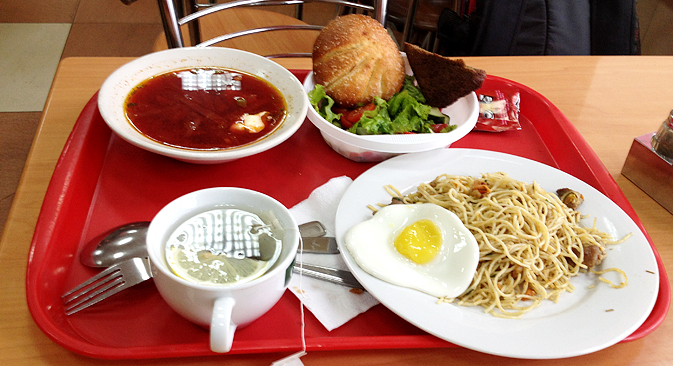 A meal in a Russian cafe. All photos by Errol Chopping. Errol Chopping shares his experiences with the Russian cuisine in both the European and Asian parts of the country. I recently took a tourist cruise from St Petersburg to Moscow. It was excellent. It was extremely well organised, the accommodation was good, the scenery wonderful, the food was great, every excursion was well planned, all the guides spoke English and we had plenty to do. Everything that could be done was done. Meal times were memorable too. All meals were either a set menu or a buffet and the set menu consisted of 6 courses. Table wine was provided, as part of the meal. What else could you ask for? We usually arrived about 7:30pm for our evening meals, which were advertised for 7:30pm. Sometimes we were a little late, maybe 7:40. Sometimes were a little early, at 7:25. No matter what time we arrived, every evening, the restaurant was 95% full when we got there. Almost all the guests were extremely early. Most arrived at about 6:45 for a 7:30 start. They were allowed in, took their tables, and started to eat. When we arrived, on time, every table was occupied. We had to ask one or another group of diners if it was ok to join them at their table. No-one ever said no and we met lots of different and really interesting people. The only problem for us was that while we were looking over the menu, they were already typically on their second or third course, having been there for at least 40 minutes. I am still confused, (which is not uncommon), but I can’t understand why almost every passenger needed to get into the restaurant early. Perhaps they wanted to sit at the same table every evening, or perhaps they wanted to sit with, and only with, their group, for every meal. I think most people on the tour were a little anxious about eating away from home and wanted predictable and regular meals with no surprises and without the need to negotiate. We only had to eat off the boat once, and that was at a restaurant where the meal came pre-ordered. No-one ever had to engage with a Russian person, no-one ever had to eat any Russian food, no-one had to speak or read any Russian language and certainly no-one ever had to combine grappling with the language while ordering local food. Tourist cruises make this the norm, and that’s part of their attraction. For me though, eating out in a foreign country, Russia, is a great delight. I used to be nervous, worrying whether I could make myself understood or not. I thought, perhaps I’ll go hungry, or get something yucky, or I’ll make a scene, unintentionally, and everyone in the place will stare and laugh. I needn’t have worried, logic was on my side. I realised, eventually, that restaurants sell food. Actually, they have intentionally obtained food and want to sell it. Patrons, on the other hand, like me, whether they can speak the language or not, or know the food or not, are usually hungry and go into the restaurant intentionally to eat. We’re happy to spend money too, to buy food. What could be a better arrangement? It’s a no-brainer. I recall our first meal out in Vladivostok. We’d graduated to the Versailles hotel by then, at number 10 Svetlanskaya and directly opposite its entrance, at No 1, is a кафе бар (café bar). First, it’s a cafeteria, so all the food is on display there. You just collect a tray, place it on the silver rail, and slide it along pointing at what you want. You say, (a gesture will do) "One of those, please" and the lady behind the counter plates it up and passes is over. You add it to your tray and move on. At the checkout a woman, who initially looks stern, rattles quickly on the cash register and announces a number. You don’t understand, and again a gesture shows this, so she turns the display around and you can see the cost written there. You pay. She gives change. Transaction is complete. No Russian language is needed. I’ve tried some other places too, which I’ll tell you about, but the Café Bar is easy and quick and reliable and is a good place to start. In general, if you’re nervous, I’d say choose a cafeteria. Like most people, we loved the harbour side in Vladivostok. Down there is Pasta and Pizza restaurant, the Mauro Gianvanni. We tried it out on our first summer visit. There, when you know only a little Russian, it’s possible to read the menu, but even if you can’t do that, the pasta and pizza have the standard names we all know, coming from the Italian, and sound almost the same in English and Russian, so it’s easy to order. Gianvanni’s is an excellent restaurant too because you can look out onto the promenade and watch the passing parade. People walk by, some look in, and the patrons definitely look out. It’s like dining on the footpath, which is so loved in Australia. I particularly like the pasta carbonara there. It can happen that you don’t speak the language, don’t know how to read the menu and that the food is not predictable, like the pasta is at Mauro Gianvanni. This happened to us in Blagoveshchensk. We arrived there on a fantastic summer’s day, on the ferry after crossing the river from Heihe in Manchuria. Maybe I’ll tell you about the ladies sunbaking on the bank there sometime. We walked into town from the port and found a lovely little restaurant in the main street. Blagoveshchensk is not a tourist city and no-one spoke English in that restaurant, no waiter, no proprietor and no customer. At that stage we knew only a few words in Russian. We knew один (one, pronounced adin) and два (two, pronounced dva), luckily, and спасибо (thanks, pronounced spasiba). When we looked over the menu, there was only one word on it we could figure out: суп (soup, pronounced soup!). What should we do? We weren’t inclined to have only суп. I remember I just pointed at something on the menu, a random choice. The waitress wrote it down. I didn’t know what it was. She said один? (one?) I said нет (no, pronounced nyet), два спасибо (two please). So we now had two of something. I pointed again. Two of something else. We danced this verbal waltz several more times. I finally stopped after four or five choices. We waited and eventually out came the food: two small pieces of chicken with ham inside them, two ripe tomato salads each with sour cream on the side, two minestrone soups (I guess I had pointed at суп), two bread rolls. Two beers. Unbelievable. One of my most enjoyable meals. I know what you’re thinking. I have thought about it too. There’s a chance that she got sick of the "one? "No two" conversation and also sick of our hopeless random food choices. There’s a reasonable chance she thought "These two idiots don’t know what they want, I’ll just give them a decent meal." Whether our choice in food came from our good luck, or it was courtesy of her sensible interpretation we’ll never know. It tasted great though. There are those treasured times when a local host takes you out to eat. There are several benefits to this. First they choose the restaurant and they do it knowing what’s good. Second, there’s great company and the meal is likely to be of authentic national style and taste. I recall being taken out to dinner by Yuri and the team from the Academy. Vladivostok is very picturesque and this restaurant on a top floor really did take make the most of the view. It had long, high and wrap-around windows looking out over Golden Horn Bay. The Russian meal started as they often do, with entrees. Nothing new here. However, entrées in Russia are not ordered individually but chosen by the restaurant. They usually include seafood, salad, fishcakes, scallops, chicken pieces, soup, pasta, ikra (caviar), blini (pancakes) and other delicacies. All of this is sharable too, and it’s part of the deal to pass it around and comment on what you like or don’t like. The entrée stage tends to last for hours too and the restaurant is unwilling to clear it away until they are sure everyone has had enough. Main courses are chosen individually and are often single-element dishes. A steak or a lamb fillet or a fish. The standard drink with meals is cranberry juice, provided for everyone in tall wine glasses. Vodka is used for toasts, in small glasses. On this occasion as I remember it, there were twelve of us. We all drank cranberry juice and ten of us took part in toasts, which starting as tributes to returned wanderers and later included toasts to women. Over the evening, between the ten of us we consumed seven litres of Vodka. Russians love Shashlyk. Shashlyk is made from tender and marinated pieces of pork, rolled and skewered on a metal rod and barbequed. There are lots of places where you can get it too, in roadside cafes, outdoor eating areas, and in timber huts along the beaches. It often comes with onion rings on top and can be accompanied by small roasted potatoes flavoured with bacon, and salad. An experience I will never forget is a shashlyk cookout. Nodar and Anya bought pork in a local supermarket. Nick and Veronika bought beer. Nodar also bought fire accelerant. We drove for quite a while and eventually arrived at an abandoned airfield in the hinterland of Vladivostok. We found picnic tables and chairs and barbeque places ready to fire up. Wood and heat beads were soon added and the accelerant efficiently got the whole thing going. Something about the atmosphere, good friends and beer helped make this shashlyk meal memorable. As always, there’s more to tell. There’s eating in a home, which is as authentic as you can get. It's special too. There’re places like Two Georgians, Bar21 and the Rock Bar, which are also worth a story. There’s the salubrious restaurant молоко и мед (milk and honey) and the very personal Café Lata. Some other day, maybe.